A link to my Cornwall blog, which will record my new life living in the county, with photos, walks, flowers and anything that takes my fancy. A place or building of historical interest such as a church or castle, or an historical tale or legend. These are short travelogues about places visited over a long weekend, usually city breaks or country breaks in the UK. A walk or ‘things to do’ blog about a town or city usually on foot. This wonderful project by Lisa from Northwest Frame of Mind ran over 24 weeks (representing 24 hours) during 2014. A-Z challenge run by Frizztext. My choice of subject was Architecture. So have a browse if buildings are your thing. A photo challenge that runs every other week. This black and white challenge is topic related. Look for contrast or highly textured subjects to shoot. Hopefully you will find your creative eye will be expanded. Please do not use sepia tones (brown). Each fortnight Cee Neuner challenges bloggers to post ‘Which Ways’ – these can be anything from railway tracks, trails and boardwalks to information boards and signposts. Every week Jo will publish a walk on a Monday. When the walk is published, anyone is welcome to leave a link in her Comments, to any walk that they have taken. It doesn’t have to be on a Monday. It can be at any time and of any duration. Travel Theme by Ailsa from Where’s My Backpack. This ended in 2017. The Weekly Photo Challenge by Wordpress ended in 2018. English landscapes, streetscapes and seascapes. Stories that have a more emotional twist to them. Images of architecture and urban fragments from around the world. From Medieval to Modern – usually windows found in churches and cathedrals, but also other public places especially the more modern painted glass effect and Art Nouveau styles. Simple coloured glass can be found in Victorian houses including panels containing birds and/or floral decorations. Time for another square month hosted by the lovely Becky. The photos don’t necessarily have to be of a timepiece, but are open to interpretation to reflect time in some way, or sayings such as ‘the passing of time’, ‘a stitch in time’, or time running away from you. I love floral clocks! The first one I recall was in Great Yarmouth, I think, when I was around 8½ years old. So this would be early in the 1960s. Sadly due to continuous vandalism the clock was removed in 2005. The Floral Clock which stood on the seafront, was actually a working clock, telling the time for all to see, which had flowers showing the numbers on its face. Even the hands were covered in flowers. I also got a photo of one in Ostend in 1971 and there is one in the English Garden (Le Jardin Anglaise) in Geneva. But the one seen here is in the Princes Street Gardens in Edinburgh taken in 2016. Commissioned in 1903, it was the first of its kind in the world. Clock hands, numbers and the surrounding display comprise of growing, photosynthesising life. In 1973, an electric motor was installed to keep the clock hands moving. Before then the clock’s mechanism had to be wound daily. 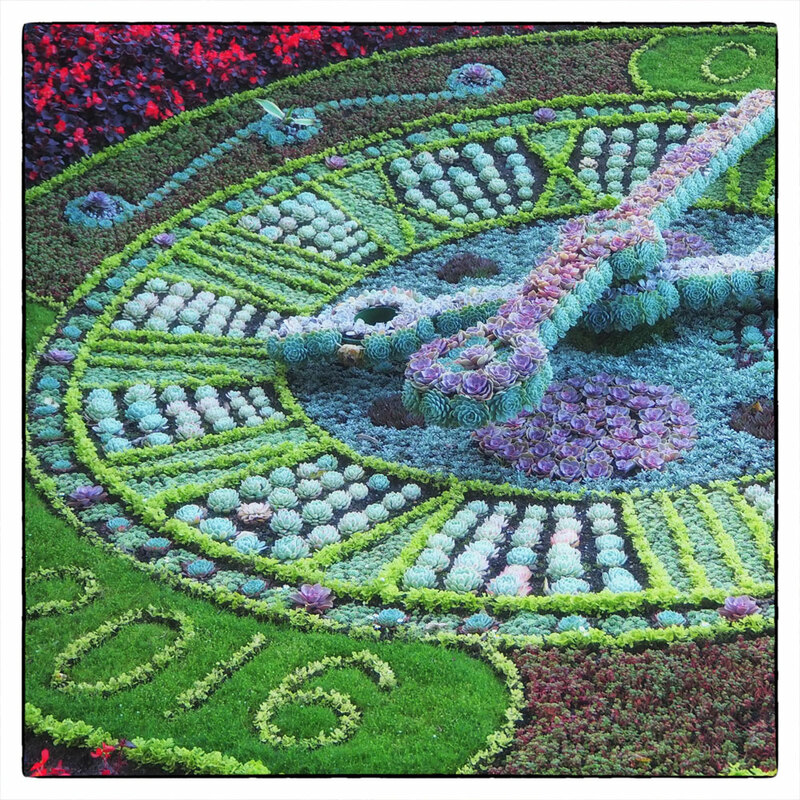 Each year a new display is planted in West Princes Street Gardens along the lines of a topical theme. Plants vary each year but some of the more commonly used varieties include Lobelia, Pyrethrum, Golden Moss and succulents such as Echeveria and Sedum. I am very glad to see that floral clocks live on. Where have you seen one? To join in with the Squares challenge please visit Becky for instructions. Remember the only proper rule is that the photo must be SQUARE. 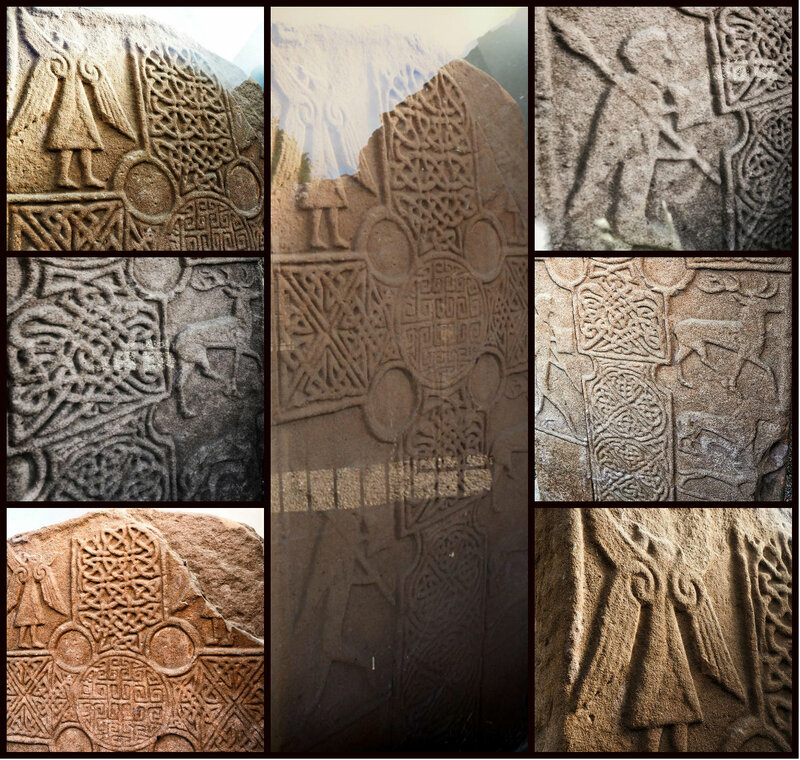 Whilst looking at the Pictish Stone in this churchyard I had to take a look at the unusual headstones, including a series of tablestones. 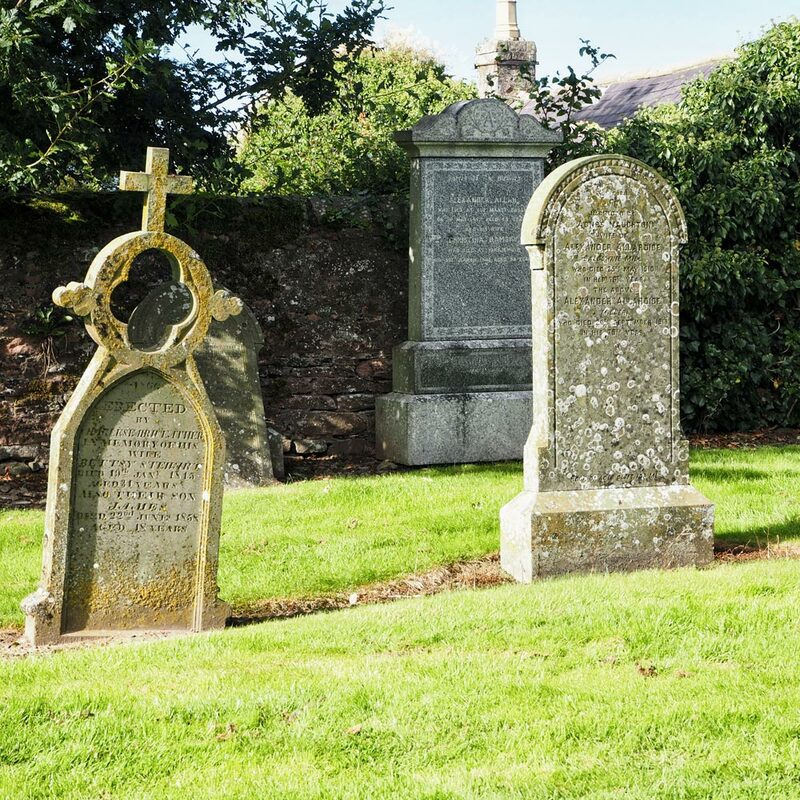 I am always curious to see what symbols have been used on the headstones. Here the hourglass is used which symbolises a short life or swiftness of time. The cross and skulls as well as angel wings are common. 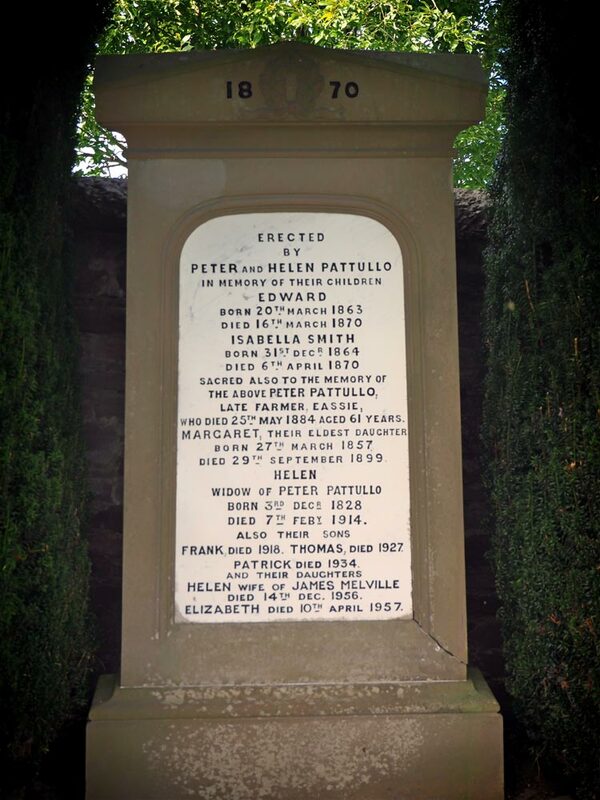 But my favourite was the pressing iron and shears that indicate the grave was that of a tailor. 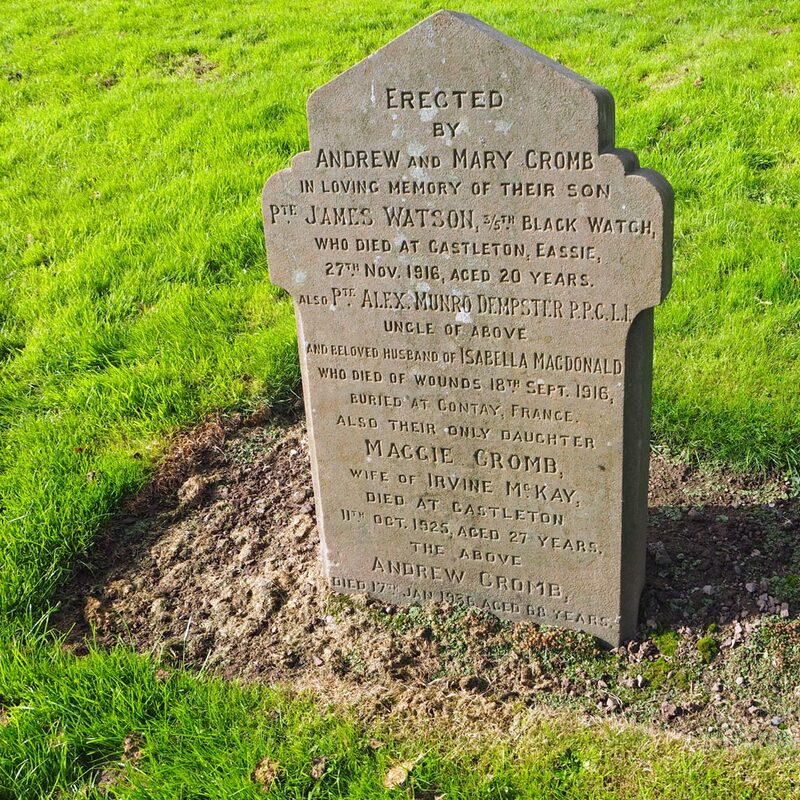 Sometimes the dates indicate some illness struck a family; above the two children died within a month of each other. The son only 4 days short of his 7th birthday and his sister not even 5½ years old. What illness struck them down? Measles? Smallpox? Influenza? 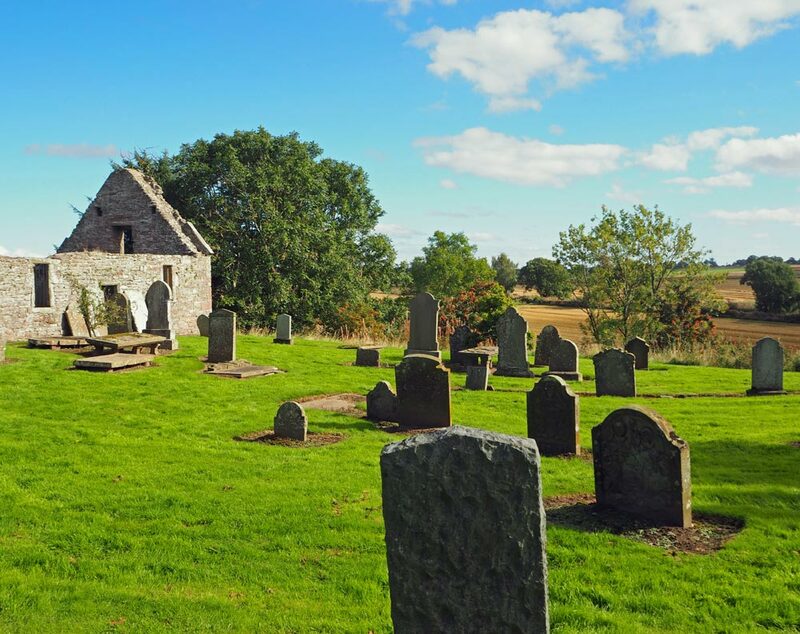 The grounds of this cemetery appear to be well looked after, the grass is short and the area around the stones is cleared, but it is sad to see some of the old headstones broken and discarded, some in piles, others propped up against the walls of the ruined church. Lichens and moss make some of them illegible. 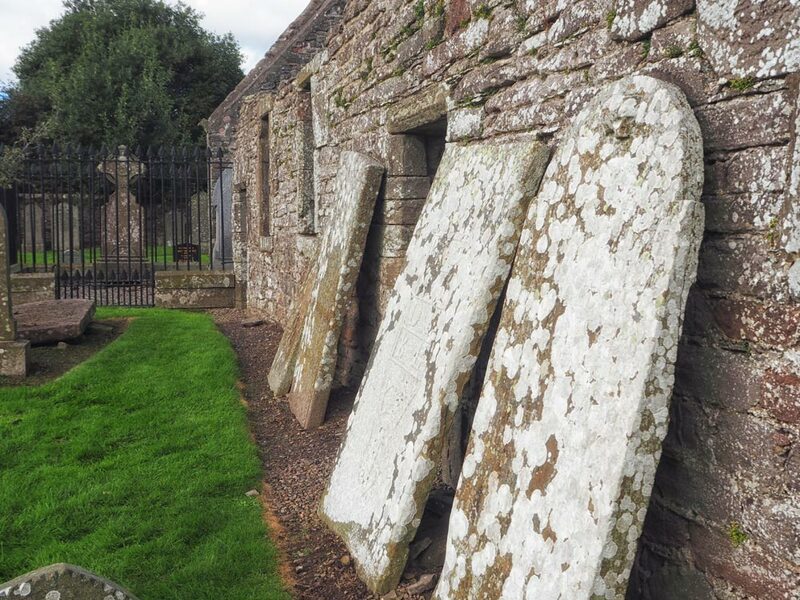 When we take such great care to protect one ancient stone (the Pictish Stone) we also need to protect stones that in the future would also relate our history. Formed at home bases in March and April 1915. All moved to Bridge of Earn and later in 1915 to Ripon. 8 April 1916 : renamed 4th to 7th Reserve Bns; on 1 September 1916 4th absorbed all others. Moved to Edinburgh in May 1918. The Eassie Cross Slab stands 2.02m high by 1.01m wide. It was found in the burn that flows past the churchyard in about 1850. Today it stands within the east end of the shell of the Old Parish Church, displayed within a transparent shelter which protects the stone from the weather. 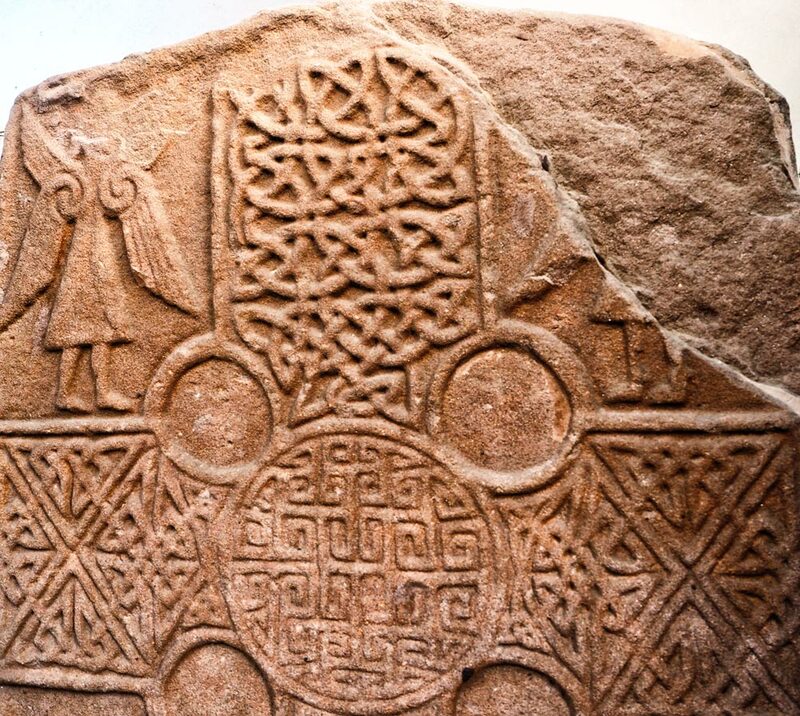 The front of the cross slab is largely covered by a very finely carved and detailed cross. It is thought to have been carved in 700s or 800s. The interior of the cross is filled with intricate interlaced patterns. In the four corners are a four-winged angel, mirrored in the opposite corner though this one is extensively damaged. At the bottom left is a hunter wearing a cloak and carrying a shield and a spear and opposite are a series of animals including a stag and a hound. The rear side is more eroded and damaged, but several carvings can still be identified. At the top left is a mythical beast ‘elephant’ and two disks along with a Z-rod. Both of these are Pictish symbols. 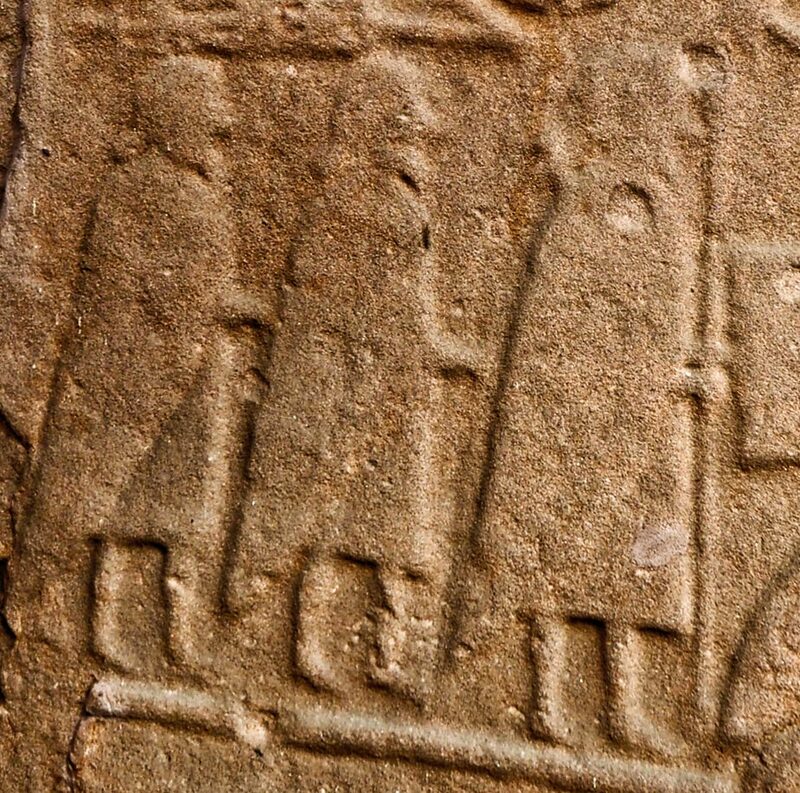 Below this are three men in cloaks, knee-length tunics and carrying staffs. And below the men are three cows, one of which appears to be wearing a cow bell. 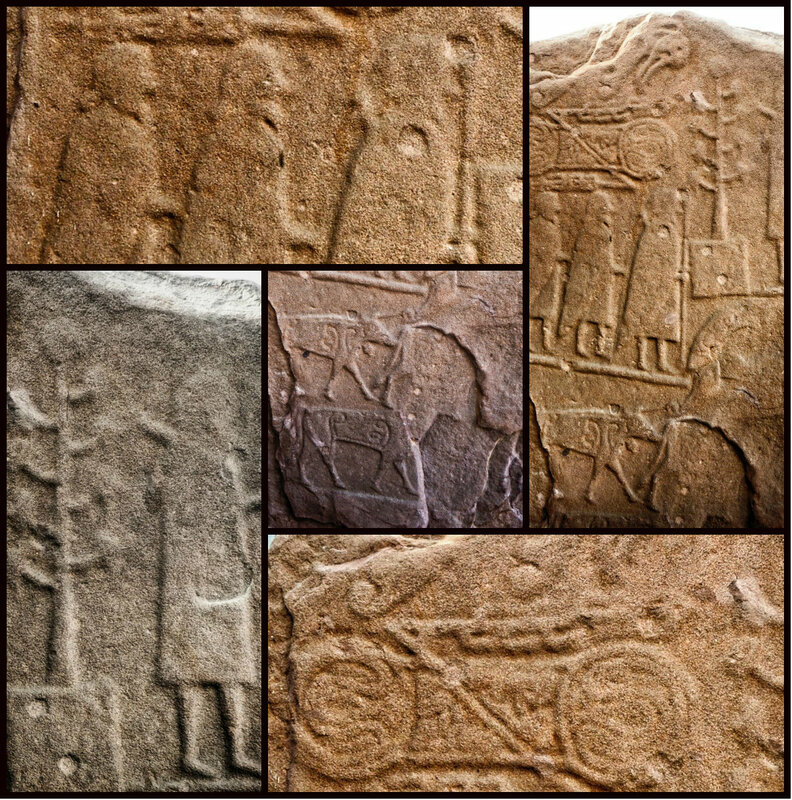 Top right is another Pict wearing a tunic and carrying a staff or spear next to a potted tree. The bottom right is badly damaged but could contain a horseshoe in the centre. 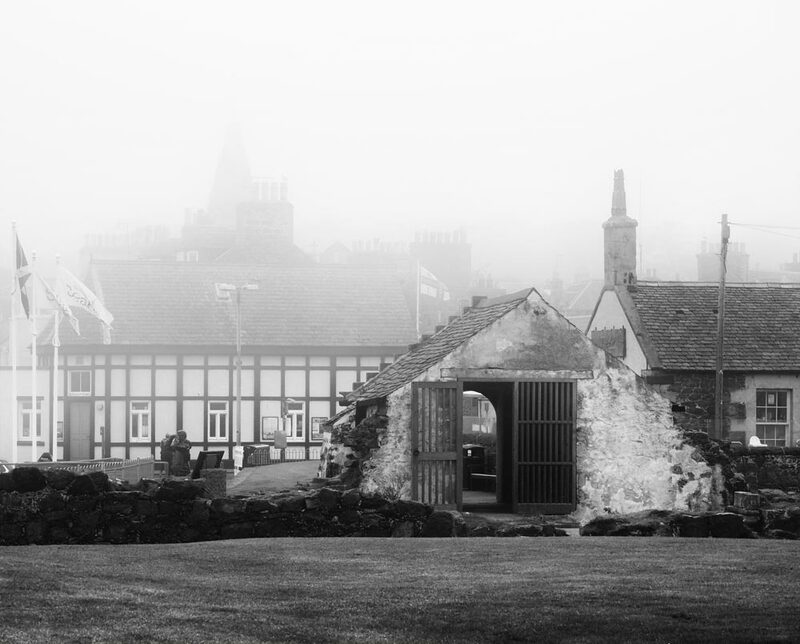 The only remains of St Andrew’s Old Kirk in North Berwick is a small white-harled stone building which stands just inland from the path to the Scottish Seabird Centre.